With the GTR-1000, Kawasaki produced a motorcycle that offered the best of both worlds - a real high performance bike, (especially the A1-A4 models), that was also supremely comfortable. It could cover huge distances and still keep the rider comfortable, warm and dry. I've ridden nearly 1,600 miles in a day on one so I know what I'm talking about! Usual legal cop out: The information on this site is for guidance only - if it doesn't work don't blame me. 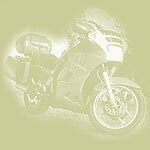 This site contains useful information for all Kawasaki GTR 1000 owners - including motorbikes and spares for sale. Used Kawasaki motorcycles for sale can also be found here.